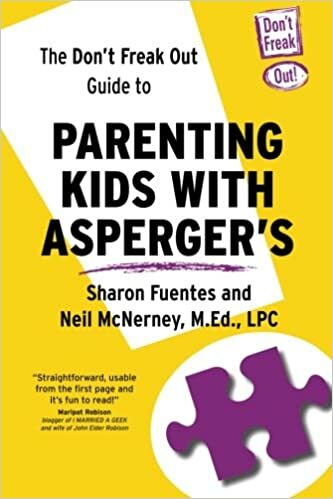 There is a terrific Blog that I have found called Life in the House That Asperger Built where the author Laura writes not only from a mother of a child who has Asperger’s point of view, but from the point of view of a person who has Aspergers, as she herself is an Aspie. She recently started a new column called Ask an Aspie. I love it! How great is it to ask someone who is able to articulate so well questions I have about Jay. She gets my son. Clue words are big for us. We use them often. When Jay gets excited and starts flapping we will say, “Clap it don’t flap it”, for which he will stop flapping and clap his hands together instead. He then is reminded that he was getting over excited and calms himself down. When Jay blurts out something totally random we will say, “Wow that was unexpected!” He then knows that he has gotten off subject or perhaps that something he thought he was only thinking about has actually slipped out of his mouth. Once again he takes a breath and becomes aware. These are the types of things that we are teaching him so that he can get along in the so-called “Normal” world. For most kids they come naturally, but for Jay… he has to learn them. Jay cannot pick up on the fact that someone rolls their eyes or yawns in boredom when he is talking to them. If they turn to walk away… he will follow them. You can only imagine the effect this has on his fellow classmates. So this was not just a problem that would give me 5 minutes of peace (Although that would be a nice benefit to him getting this) but it is a matter that must be addressed in order for my son to function in the school environment, the work environment… any social environment. My boy is smart! I mean he is really really smart! When he is faced with a problem… he will look at that problem, dissect the problem and keep at it until he comes up with at least one solution. The solutions are usually extremely creative and make complete sense too. Jay came up with an incredible solution… one that we are using with both kids and wow it is working! He came up with a street light analogy. When he starts talking if it is okay and I don’t say anything then he will assume he has a green light which means “GO Ahead and Talk”. If I say Yellow Light well that means “WAIT”. Jay needs to wait a minute so that someone else can have a turn and offer their opinion or add to the conversation. During this time Jay should be listening to the other person and not just thinking about what he wants to say. This yellow light is the hardest one for Jay. And then of course there is the red light which means “STOP”. This means he needs to stop talking all together. The past three days it has sounded like a huge game of red Light Green Light in our house, which has caused a lot of giggles. But it is working. Slowly Jay is getting it. I hope one day we will no longer need to use these clues. But until that day I guess I will just get myself a pair of white gloves and a whistle and get ready to direct some traffic. I think that’s a great idea! I have to tell you, that this just came up with Coleman too, and it didn’t occur to me, until like YESTERDAY to do the “decoding” thing with him, like I was suggesting today on my blog. I love this! that boy is creative! I will have to tell D about this, we will practice it as well, and perhaps next time they are together they can encourage each other and take turns. It is hard to wait when they both have so much to offer!